Ironing a dress shirt is a job that some people make look easy but those people tend to have had a lot of practice, if you have a custom dress shirt and you are ironing it yourself for the first time it is well worth taking your time on the job. 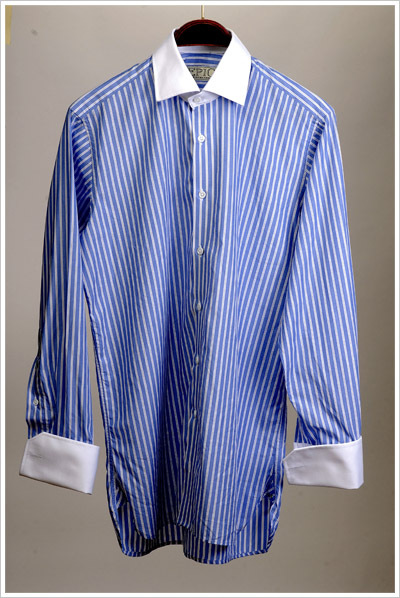 If you buy a custom dress shirt online it may get creased in the post and will need to be ironed before wearing it: do bear this in mind and don’t go to unpack your custom dress shirt to find that it is creased when you need to be heading out the door wearing it in ten minutes time. As well as taking your time when ironing your custom dress shirts it always pays to make sure you know what you are doing first; examine your iron and look at the settings: it may have settings for different material types on the dial and should also have temperatures. Look at the label for your shirt and find the material, most shirts will also give a temperature for ironing or may have a label saying something along the lines of ‘iron on a low heat’. The other thing you may see on a custom dress shirt’s label is ‘iron inside out’: this is common where there is a pattern or embroidery on the outside and on fabrics that can easily be damaged if too high a heat is used. Even without this label though the first few times you use an iron you may be best to iron the inside of the shirt in case you do accidentally cause damage to your dress shirts. So once you have set your iron’s dial fill the iron with water to the level shown and switch it on. Most irons take around five to ten minutes to warm up to the temperature you have chosen and if you try to use the iron before this you will struggle to remove creases. While your iron is warming up and at any point where you put it down make sure it is on it’s end not on the metal plate. Most importantly of all do not leave your iron on your custom dress shirts or on the ironing board cover for more than a few seconds. You will usually want to keep the iron moving constantly unless you have a particularly bad crease to remove and then do not leave for more than a couple of seconds or you could burn your shirt. To iron your custom dress shirts iron one of the breasts at a time and then the back and collar: after this put the arms over the end of the ironing board and iron as much as possible before moving the arms over the ironing board to iron fully, having made sure that both sides of the arm are lying flat. To iron around buttons use the pointed edge of the iron to go between them and make sure cuff buttons are undone and the cuff laid flat if possible.